For my second monthly post on history and historical fiction (see last month’s here) I’m going to focus on a topic I know very little about: Ancient Rome. 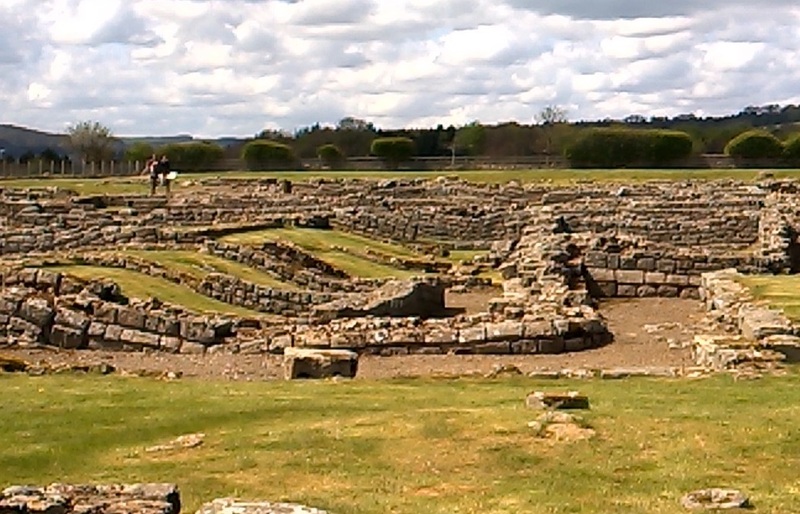 Despite living close to Hadrian’s Wall, I’ve never been particularly interested in Roman history and have only ever explored one or two of the many sites along the wall, but last weekend I decided to take advantage of my English Heritage membership and visit Corbridge Roman Town. Hadrian’s Wall was built in AD122-30 during the reign of the Emperor Hadrian and stretches for 73 miles across the north of England. It does not separate England from Scotland, as many people believe! 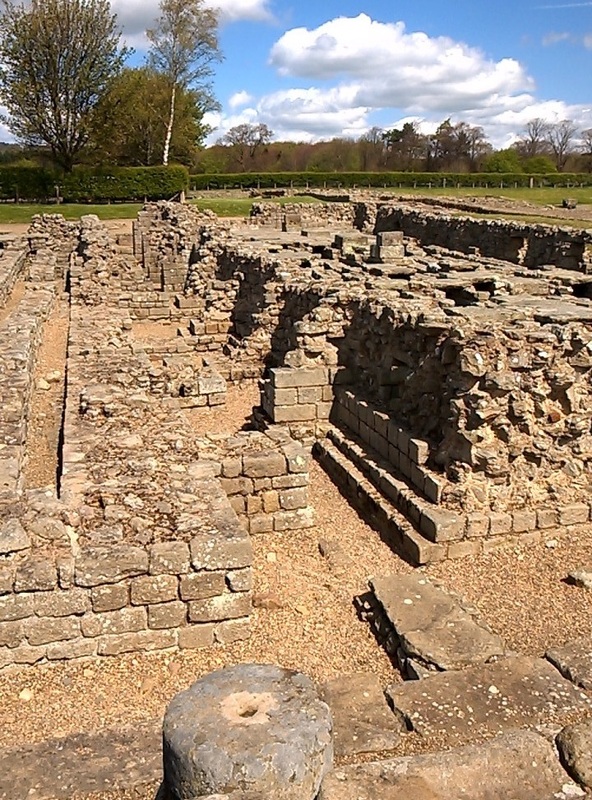 Corbridge, in Northumberland, was the site of a busy Roman town and supply base and the remains of the streets and buildings can still be seen today. As well as walking around the ruins, there’s also a museum where you can see a display of some of the items excavated from the site, including the Corbridge Hoard (a collection of Roman weapons and armour found buried in a chest) and the Corbridge Lion (a large stone statue which was originally an ornament from a tomb). This brief sojourn into Roman history made me wonder why it is that I so rarely choose to read books about the Romans. It’s just not a time period I’ve ever felt drawn to, though I’m not sure why that should be. A quick search for posts using the ‘Ancient Rome’ tag on my blog brings up only two novels set in Rome that I’ve read in the last few years – Colossus: The Four Emperors by David Blixt and Cleopatra’s Daughter by Michelle Moran – and I’m having trouble thinking of any others that I may have read before I started blogging. I would love some recommendations! I already have copies of The Eagle of the Ninth by Rosemary Sutcliff and I, Claudius by Robert Graves. Do you think I would like either of these or is there something else you would recommend? Fiction or non-fiction, books set in Rome itself or in other parts of the Roman Empire – all suggestions are welcome! Claudius is one of my all-time favourites, you should give it a try! Thank you, Frauke. I’m glad you enjoy my reviews. I haven’t heard of the Ruso series, so thanks for the recommendation. And I’m definitely going to try I, Claudius soon! Two good history books are The Classical World by Robin Lane Fox (which takes in Ancient Greece too, but is a good introduction) and Tom Holland’s Rubicon. The latter was the book that made me understand for the first time how fascinating the history of that period is. Adrian Goldsworthy’s biographies of the early Roman emperors are meant to be good, but I can’t speak for them myself; I’ve just started on his book about Antony and Cleopatra, however, and that’s proving to be good so far. Thank you, Leander. I knew I could count on you to provide lots of wonderful suggestions! I’ve been meaning to read I, Claudius for years but have never got round to it – I think I’ll have to move it up my list of priorities. I love the sound of Memoirs of Hadrian too but I’ll take your advice and leave it until I’m more familiar with the subject. Reading some non-fiction first might be a sensible idea as I have such a limited knowledge of the period at the moment! The Tom Holland and Robin Lane Fox books both sound like good choices to begin with. I’d recommend all Lindsey Davis’s books – not only the Falco and Albia series, but her ‘stand alone’ novels about the first century, ‘Master and God’ (Domitian) and ‘The Course of Honour’ (Vespasian). I’ve noticed Lindsey Davis’s books in the library but have never picked one up due to my general lack of interest in books set in Ancient Rome. Now that I feel more enthusiastic about the period I would like to try the Falco series. I hadn’t realised she had also written some stand alone novels, so I’ll consider those as well. Thanks! I think you’d enjoy Rosemary Sutcliff, although it’s really a children’s book but it is one of those rare things a kids book that I’m happy to read again as an adult. Btw I live about 1 hour north of Hardian’s wall – maybe we could meet up 1/2 way sometime? I live even closer to the wall (but in the other direction) so I really have no excuse for not having visited more of the sites! I somehow missed out on Rosemary Sutcliff as a child but I’m hoping I can still enjoy The Eagle of the Ninth as an adult. 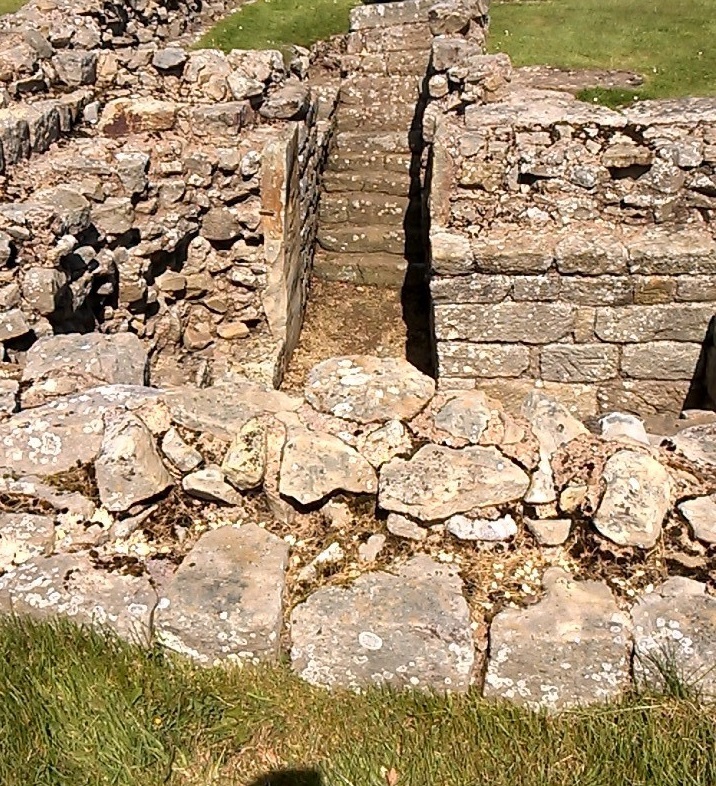 Favourite site is Vindolanda – but although I loved visiting the sites (I both worked in and studied archaeology at one point) I’ve never felt drawn to adult Roman fiction either despite enjoying The Eagle of the Ninth. I should probably read something more factually accurate to begin with as I’m so new to the period, but I do love the sound of The Ides of March. I’ll definitely keep it in mind! Corbridge sounds and looks like a fascinating place to visit, thank you for sharing your photos. While I have watched many documentaries, TV series and films on the Romans, I sadly can’t think of any novels I have read based in the time period. I would like to read The Eagle of the Ninth by Rosemary Sutcliff as I enjoyed the film The Eagle (2011). It’s worth visiting if you’re ever in this part of the country, though there are some other sites along the wall that are bigger and more popular. I haven’t seen the film version of The Eagle, but I’m glad you enjoyed it. I’ve never felt very drawn to films or TV series about the Romans either! Sutcliff wrote a bunch of novels following the same family through Roman Britain into William the Red’s reign. The first was EAGLE OF THE NINTH, so if you like that you can look for the others – I don’t have all the titles memorized, but a couple were SILVER BRANCH (approx Constantine Chlorus’ era, he was THE Constantine’s father), LANTERN BEARERS (legions leave), and the SHIELD RING which is the Norman one. Her Arthurian SWORD AT SUNSET linked to LANTERN BEARERS, too. And there’s Gillian Bradshaw who wrote unconnected historicals set in the ancient Roman world: BEACON AT ALEXANDRIA is the one everyone talks about, and it is good and wanders all over the eastern part of the Empire, , but I’ve always liked BEARKEEPER’s DAUGHTER (Justinian & Theodora), and ISLAND OF GHOSTS (late Roman Britain and Sarmatian cavalry). Avoid IMPERIAL HORSES, as everyone I know who read it wants to swat the viewpoint characters, or get them into couples counseling or both. Thank you for the suggestions, Elaine. I’m determined to find time to read The Eagle of the Ninth soon and if I enjoy it I’ll certainly look for Sutcliff’s other Roman books. I haven’t read anything by Gillian Bradshaw, although I’ve heard good things about her novels. I’ll look out for Beacon at Alexandria or one of the others you’ve recommended. Oh I adore Gillian Bradshaw. She is one of my favourite authors ever. Have you read Imperial Purple? Bradshaw is one of my favourite authors! Imperial Purple is another fine novel by her. And Rosemary Sutcliff — I lover her too. Eagle of the Ninth is so worth reading. Thanks for commenting, Anne. I think I definitely need to try both Bradshaw and Sutcliff as soon as possible! I was going to suggest Lindsey Davis, but I see other people have beat me to it. I am making notes from some of the other suggestions though.if you want aN older book, Kipling sets some of Puck of Pook’s Hill in Roman Britain. Thanks, Lisa. I’ve never thought about reading Puck of Pook’s Hill but I’ll definitely consider it now! Ancient Rome is one of my favourite historical eras but for some reason I find it hard getting into fiction set around this time. I’ve no idea why. Kate Quinn has a series of books from a more female perspective which seem popular, I haven’t gotten around to reading them myself yet so I’m hesitant to recommend them. By coincidence, I live near that other wall – Antonine! I have no idea why I struggle to get into fiction set in Ancient Rome either. 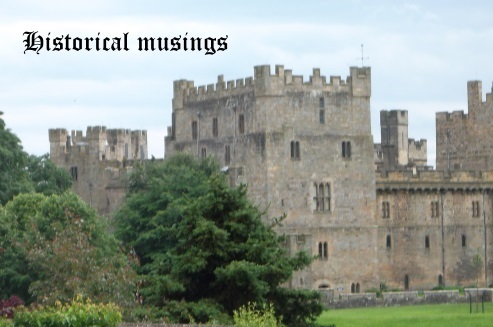 I don’t have this problem with other time periods – apart from maybe Ancient Greece! I’ve noticed Kate Quinn’s books on other blogs but haven’t tried them myself, though I do like the fact that they’re from a female perspective as a lot of Roman books seem to be male-dominated. I enjoyed I, Claudius, too (it has a good first sentence! ), though I’ve not gotten around to reading the sequel yet. Thanks, Aarti. You’ve convinced me that I really need to try the Falco series as soon as possible. I’m not too concerned about learning the politics of the period – I’m just hoping to find some books that will make me feel more enthusiastic about Ancient Rome! Pompeii by Robert Harris is a good one and quite short. He also wrote two other ones based on Cicero: Imperium and Conspirata; they are part of a trilogy but I don’t think the third one has been released yet. I cannot tell you how good the latter ones are because I haven’t read them. There is also I am Livia by Phyllis T. Smith, which I haven’t read either but it’s about that time period. Thanks for reminding me about Robert Harris. I read An Officer and a Spy last year and really liked his writing, so I’m sure I would enjoy one of his Roman books. I’ll think about reading Pompeii since you’ve recommended it! Like other commenters, I really enjoy reading about Ancient Rome and watching documentaries about it, but I’ve never been drawn to historical fiction set in that time period. It’s good to have some recommendations though as sometimes it’s just a matter of knowing where to start. I always think the Steven Saylor books about Rome look interesting. I’m overwhelmed by all the great recommendations here and can’t wait to start reading some of the books people have suggested. Steven Saylor’s books do look interesting…another author to add to my list! The definitive ancient Rome books are Colleen McCullough’s “Masters of Rome” series, and they’re amazing, but VERY long. I loved Colleen McCullough’s The Thorn Birds when I was younger, but I never tried any of her other books. The Masters of Rome series does sound good, especially now that I’m more interested in reading about Ancient Rome. Like I said, they’re not easy, but you’ll learn SO much from them!